The Sony CMT-CX5BIP might have the brains and the looks but does it perform? There once was a time when mini and micro hi-fis were a stalwart in the product lines of most house-hold names, but since digital came along and put the kibosh on pretty much most physical media, cross-functional devices have dwindled. The Sony CMT-CX5BIP, however, defiantly flies the flag for this format, offering a wealth of playback options - outnumbering TDK's versatile Boombox for inputs - and costing barely a third of Geneva's nearest competitor, the Geneva Model M + CD. It's not like Sony are newcomers to this game, so it's no surprise that the build is pretty decent. It's a little disappointing that the speakers don't clip onto the main body, should you wish to treat the unit as one, as it seems an obvious omission. Also the iPod dock uses a series of interchangeable plastic mounts (for different iPods natch) that feels a little bit clumsy. 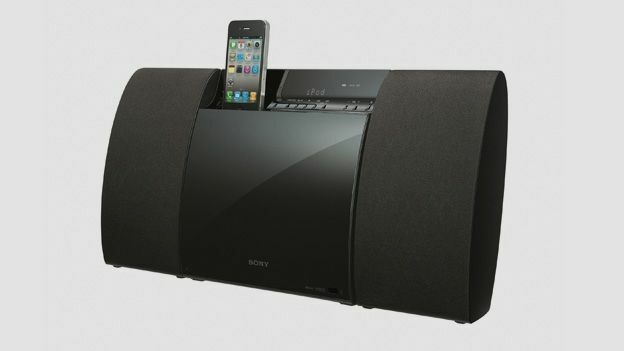 While it offers an iPod/iPhone dock along with auxiliary outputs, CD capability, and DAB, FM and AM tuners, the Sony CMT-CX5BIP doesn't feature Bluetooth, like the Philips Fidelio DS8550 dock, or USB like the TDK 3-Speaker Boombox, but you're still very well covered. Other features are pretty limited, stretching to rudimentary sound control (read Bass boost) with the DSGX function, and some timer options. For a device with a fairly small footprint – about the same as the Arcam rCube in total – it still manages to hold its own in the sound department. The 40W lungs on it will definitely fill the average sized bedroom for which it was likely intended. Micro hi-fis aren't for the audiophile generally, so it is still a little bit of quantity (volume) over quality (transparency) but it's likely to please most casual listening ears. Is the Sony CMT-CX5BIP reasonably priced? Yes it is. Does it have all the major connections and features that a micro hi-fi buying consumer would want? Yes it does. How does it sound? Pretty good. It is based on these simple facts that you have to proclaim the CMT-CX5BIP a success. Job well-done Sony. That's not to say it's without niggles. Why it wasn't designed to clip together as one, we don't know, and the implementation of the iPod dock adapters is a little poor at best, but if these are our main concerns, then the CMT-CX5BIP has done its job well.